April 20, 8pm. Tickets going fast! 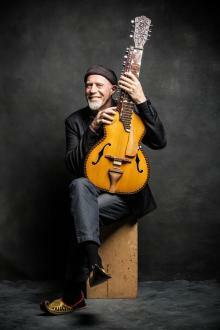 Multi-award-winning Harry Manx brings East and West together like no one else can and he’s coming to the Playhouse Cinema with his unique blend of Indian folk melodies mixed with slide guitar blues, a touch of gospel and some absolutely inspired grooves. If you are new to Harry’s music, which has been dubbed “mysticssippi,” we promise you a truly unique musical experience. This is a one-of-a-kind musician with a one-of-a-kind sound. Harry was a blues-man with a gift for playing the slide guitar. It was what he did and what he loved – until the day that he became a student of Grammy-winner Vishwa Mohan Bhatt, who had invented a 20-string Mohan Veena (similar to a Hawaiian guitar with drone and sympathetic strings like those on a sitar). From that point, Harry’s music and his musical career took a life-changing turn. Watch -- Harry Live on Stage at the Princess Cinema in Waterloo, playing Bruce Springsteen's 'I'm On Fire' like you've never heard it before, plus some extras!